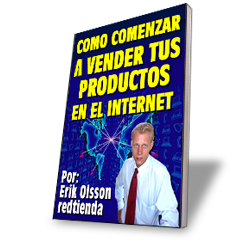 You have just found the most powerful software in Spanish (and English) to create online stores – now more than 2300 stores, in 50+ countries! You have the products – we give you the store! Discover how you can create an online store for your business and start selling your products on the Internet, using our cutting edge Swedish eCommerce software redtienda. 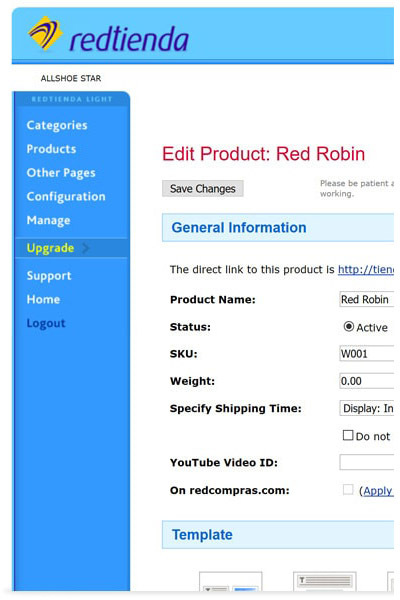 Your store will have your product catalog and cart. Or create an even better online shop with REDTIENDA GOLD. Your customers are using the Internet every day. Don't miss out. An online store can serve them and also get new customers. By using redtienda, you will be up and running in no time. I's very effective. And it will give your company a lot of other advantages and benefits. We handle the technology so you can focus on building your online store and business. Secure Web hosting is included so you can start right away. Simply use the Web browser on any computer to work on your store. There is nothing to install and the software is always updated with new functions. Creating your online store is simple and flexible since you use templates and then can customize the content on all your pages to get a unique design. A clean store that is easy to use with great content and offers is what sells. 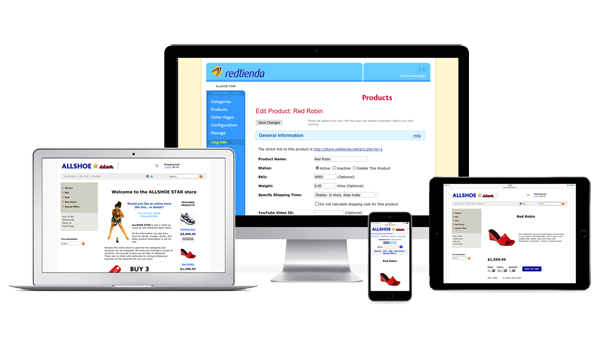 Since 2000, thousands of stores rely on redtienda to sell their products online. redtienda comes in 2 versions. Use the free LIGHT forever, or upgrade to the paid GOLD anytime for full potential and to get a more professional store. Increase your productivity by using the many innovated features of redtienda. Everything is there to facilitate your work and to increase your sales online. The world is mobile today. Your online store will look amazing no matter what type of device your customers are using to shop. Learn more: How to Create a Store + How to Manage a Store + What is an Online Store? Why redtienda? Because You Want Results! The services of redtienda corp. are the most complete that we have seen. They are easy to use and give emphasis on our language. In the month of May we managed to close more than 10thousand dollars of sales of our products thanks to the format of REDTIENDA. Redtienda is without doubt the most professional ecommerce solution and manageable in all senses for the Hispanic market. With the 10-Step Store Creator, you can quickly create the "basic setup" of your online store in just a few minutes. See how easy it is in this video (in Spanish). After that you continue to create your store in the store manager. It is very simple following our guides. And when your store is open, you use the same store manager to manage and always update your store. Click here to get started in 5 minutes, 100% free. Or start with REDTIENDA GOLD directly. Design your store, add your products, categories, make configurations, etc. In Google, Facebook, do joint ventures and other appropriate marketing methods. Use redtienda to manage orders, customers, do updates, promotions, etc. With an excellent store, in-demand products, extensive marketing, great management, and a lot of hard work – your business will be successful online! What works best for you? You start with REDTIENDA LIGHT which is 100% free for life. Include up to 10 products in your fully functional store without investing any money. You can upgrade to REDTIENDA GOLD if you want a more powerful and advanced store. Include as many products as you want, use your own domain, accept payments online, etc. Express: You can also get started with REDTIENDA GOLD directly and Save $50 USD! You will get all the essential benefits from start for less than the cost of a coffee a day. The redtienda stores can include their products on the #1 Hispanic shopping portal redcompras.com for free. Sell more products by showing your own or other's YouTube videos on your product pages in your store. Use REDTIENDA GOLD to accept credit cards in your online store through the integrated 2CheckOut. Include your products in the leading Latin American price comparison platform Buscapé. Connect your Facebook (and/or Twitter) account in your menu, and allow visitors to share your products. Increase your orders and sales by letting your customers pay with PayPal (integrated with REDTIENDA GOLD). Your name and email are stored so we can send you the course and newsletter. For bloggers, consultants, webmasters, etc. Recommend redtienda to other businesses and earn well-paid commissions. Joining our associate program is free and there are no obligations. Learn more and apply here. "Ecommerce in a solid, economic and reliable platform"
"The Best of the Internet...Your Own Online Store"
"...Comercio Digital launched an innovating product"
"In particular, offers an easy functioning..."
"The first steps of an online business"
And Sell Your Products on the Internet. Start today! Open an online store for your business. Recommend redtienda and earn nice commissions.